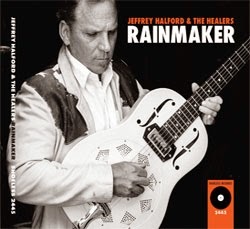 I just received the newest release, Rainmaker, from Jeffrey Halford & The Healers and it rocks. Opening with title track, Rainmaker, singer, song writer, guitar player, Halford is joined by Paul Olguin on bass, Adam Rossi on keys and vocals and Michael Messer on drums. A straightforward British feeling rock track, it has a very memorable melody. Lost Highway is a solid rocker with a driving beat and grinding slide guitar. Mexico has a classic 60's western/mexican feel. I really like it. Simple Link Wray like guitar work with cool riffs and effects really punch this track up and highlight Halford's vocals. Possibly the best track on the release. Vinyl has a bit of an alt rock feel like the Talking Heads or the B52's but with a 60's feel. Actually pretty cool track with some over the top organ work from Rossi and stylized guitar work from Halford. Thunderbird Motel has solid ballad characteristics in more of a folk vein. Very nice track. 2nd Chance has a folksy blues sound, with Halford on vocal and resophonic guitar and Pam Delgado and Jeri Jones adding really nice backing vocals. Nature's Choir again has a bit of a British sound almost like early Kinks or Who. Bruce Kaphan adds a flavor of steel guitar giving the track just that taste of country. Nice job. North Beach is a stripped down rocker with a really nice rhythm. Halford plays an understated slide guitar solo and Rossi on keys maintains a balance with the release overall. Cry Of Hope is a really nice ballad with beautiful crying steel guitar by Tom Heyman echoing in the background. Another of my favorite tracks on the release. Harry We Need You has a lot of strength as a basic pop rocker ... could easily be the theme song for a television show. Wrapping the release is Joaquin, a nicely constructed acoustic ballad.